Uttar Pradesh Subordinate Service Selection Commission (UPSSSC) is going to conduct interviews for the posts of Revenue Inspector (Rajaswa Nirikshak) / Kanoongo. Earlier the re-exam was held on 14 August 2016. 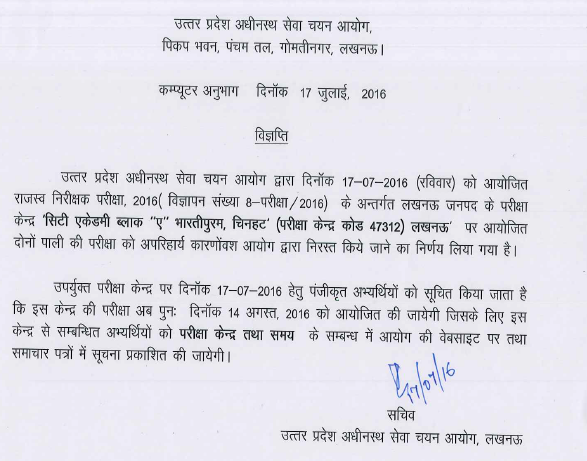 Earlier Uttar Pradesh Subordinate Service Selection Commission had completed the process of getting applications. For appearing in these interviews, admit card is what required. The Admit card of UPSSSC Revenue Inspector interviews had been released by UPSSSC now. Successfully applied candidates can download their UPSSSC Revenue Inspector Exam Admit card from here after it gets available. Uttar Pradesh Subordinate Service Selection Commission will organize interviews for Revenue Inspector posts. For that, admit card are available now and you can download them by entering your details. Candidates have to download UPSSSC Admit card for Revenue Inspector from the official website upsssc.gov.in via below link. The test will be held at various centres in Uttar Pradesh. You can find details like reporting time, exam venue, roll no., timings etc. can be checked by downloading the call letter. For that, candidate should remember the registration no., date of birth at the Rajaswa Nirikshak admit card page. The written examination consists of two papers, both of which are multiple choice objective type. Time given to solve paper is 02:30 hours (150 minutes) for Paper-I and 01:00 hours (60 minutes) for Paper-II. There shall be no negative marking for wrong answers. Interview will be of 50 marks. The candidates can download their admit card from UPSSSC website from here. In order to download the admit card for UPSSSC Revenue Inspector exam, candidates can visit this page. At the admit card download page, the registration details and DOB should be entered. After giving those details, UP Revenue Inspector Admit card 2016 will be shown by the site and you should take a print. It is mandatory to bring this admit card at the exam time.